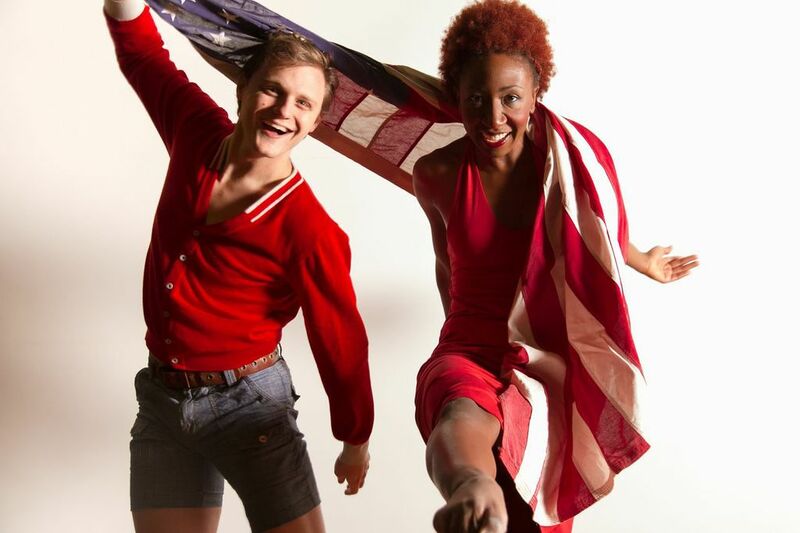 Striding Lion Performance Group’s latest endeavor, American Me, is an immersive look at the sometimes hilarious, sometimes profound, sometimes disturbing state of self-reliance and the American Dream. It’s a wide-reaching, epic journey that spans decades and genres, blending 1950’s diner tunes with 1980’s rock ballads, and weird emo modern dance with pas de chats with satirical theatre. Under the direction of Northwestern University grad Annie Arnoult Beserra, Striding Lion lives in a mythical head space that is somewhat free from the influences of other dance companies of its size. As per usual, American Me is different, really different, from everything else I’ve seen this Chicago Dance Month (and I’ve seen a lot). The bits of theatre are the really good stuff, here, such as (spoiler alert) a brilliantly constructed game of The Game of Life, or Britt Banaszynski (the sole man in the cast) being forced into a game of “Chubby Bunny” as the women shove marshmallows into his mouth. These moments worked best because of the acute focus; the wide-span of musical genres and often multitude of things happening on stage, combined with soda pop, marshmallows, text, dance, and Jeff Hancock’s zany costumes of patchworked denim make for a cluttered experience in which it’s hard to know what to look at. But maybe that’s the point. I mean, this is about America, after all. It’s about our hyper-stimulated, all-go, no quit culture that dictates you can have anything you want if you work hard enough. It’s about the pressure we feel to continually define who we are, who we aren’t, and what we want. It’s about the dream, the hard sell, and the stereotypical view of what success looks like. So, for all intents and purposes, American Me is a home run. Striding Lion Performance Group presents ‘American Me,’ running Friday – Sunday at 7pm through April 27 at Links Hall (3111 N. Western Ave.). Tickets are $10/20, available at 773-769-7540 or online.